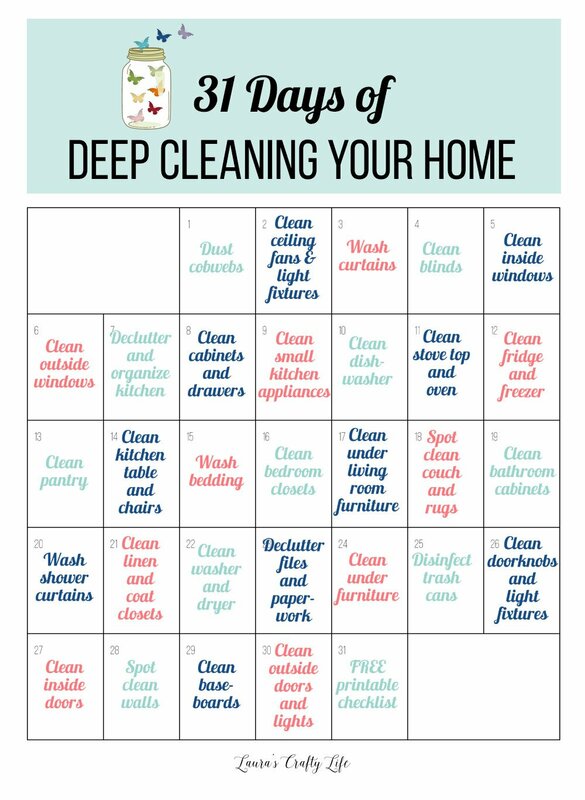 31 Days of Deep Cleaning Your Home. Get your home in tip-top shape in just 31 days. Deep cleaning lists, deep cleaning tips and tricks, ideas, and how-tos. It is here! Starting tomorrow I will be posting every day in October, sharing a task to help us get our homes in tip-top shape. These tasks are the same tasks I do for spring cleaning. Doing these tasks twice per year can really help keep your home beautiful. This will not include basic cleaning tasks like dishes, cleaning the bathroom, or laundry. What I will be sharing are those tasks most of us don’t normally do on a daily, weekly, or even monthly basis. Some of these tasks will take less than half an hour, others of these could take you a few days to complete depending on how much time you have. I have two small kids, one of which is home with me every day and is like a little tornado. I won’t always get all these tasks done in one afternoon. If you are feeling overwhelmed about getting the task done throughout your whole house, then just focus on the dirtiest or highest traffic area in your house and work from there! You will want to work top to bottom when cleaning. This way you will not be getting the areas you have already cleaned dirty again. Pin this page, as this is the one I will be updating daily with what tasks we have already completed. So, you can jump in any time! If you will be following along with me, join our Creative Community on Facebook to share progress, ask questions, and get moral support. It is always nice to have support, and motivation from others to get the job done! See you tomorrow! I’m gonna try to stick with your program! I never know where to start. Yay! I’m never good about the semi-annual deep cleaning tasks! But perhaps I’ll actually get them done this year if I follow along! Excited to join you! Glad to have you along Cindy! What a great series! I was just searching for a list of deep cleaning items to be done in the house, since I am working on having the house ready for our little one who will be arriving sometime this month (…or next month…). Looking forward to reading! Glad you found the series, Hannah! Welcome! I always get inspired when I see these deep cleaning programs. I love that you’re sharing your ideas. Not everyone is as organized. Thanks! This is a great idea. Keeps the job organized and you can focus on the day to day, instead of being overwhelmed by the big picture. Sometimes, I think the hardest part about deep cleaning is not knowing where to start. Thanks for a comprehensive list that breaks it down into manageable days! Kelli – You are absolutely right! I am a big list maker. Any time I have a job that seems to big to tackle, I break it down into smaller parts. And if those still seem to big, I break it down even farther. Doing a little bit every day or every week is much easier and less stressful than trying to do it all at once (or not starting at all because you are too overwhelmed!). That’s a fabulous list. I tend to want to knock my deep cleaning in one fell swoop. Maybe staggering it would actually help me get it done more thoroughly. I used to clean in one big session once a week before I had kids. Now that big chunk of time is almost impossible for me to attain. So, breaking it up over the week allows me to get it done what I need to without getting burned out or frustrated. My house might not be all clean all at one time, but I know the things that need to get cleaned are are actually getting cleaned at least once a week for basic cleaning and twice a year for the big stuff!